Storey Publishing, LLC, 9781612129594, 200pp. From chimichurri to teriyaki, sauces make our mouths water — and our meals shine! Bland chicken breasts, plain pasta, or simple baked potatoes are transformed into memorable dishes with the addition of sauce. 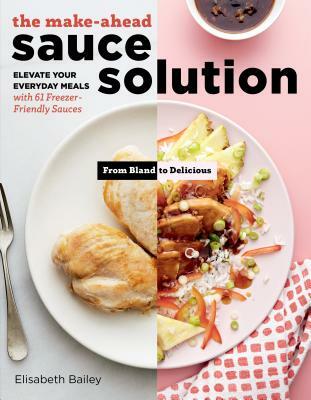 The Make-Ahead Sauce Solution features 61 flavor-packed recipes for sauces that freeze beautifully and make home cooking easy. They run the gamut from traditional sausage ragu to Thai peanut, Gorgonzola chive butter, all-American barbecue, coconut lemon, Parmesan leek, cheesy cashew garlic, and Meyer lemon spinach. Every recipe is accompanied by a quick-reference chart showing the best base combinations of proteins and vegetables. The struggle to make imaginative, flavorful weeknight meals is over. With a few of these sauces stashed away in the freezer, a great meal can be topped off in minutes. Elisabeth Bailey is the author of The Make-Ahead Sauce Solution, as well as two regional cookbooks, A Taste of the Maritimes and Maritime Fresh. She has worked as a chef and caterer and currently teaches classes on gardening, cooking, and preserving in and around Nova Scotia, Canada, where she lives.